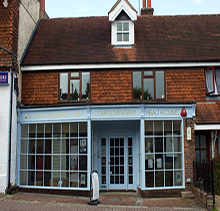 Please let us know that you found us through Sussex-Osteopath.co.uk - so we know the website is working for us! South Avenue: Free up to 2 hours. No return within 2 hours - 1 minute walk from clinic. High Street: Free up to 30 minutes. No return within 1 hour - 30 second walk from clinic. Brown Twins Road (Off Trinity Road). Free parking for 23 hours (no disc required). 1 minute walk from clinic. Disabled or frail patients can pull up immediately outside clinic for drop-off. Regular buses are available from Haywards Heath, Burgess Hill and Hassocks. This is the No.33 service. Hassocks train station is 1 mile from Hurstpierpoint town centre. Taxis can be arranged from the train station to the clinic, or the Hassocks bus service can be taken.